Organization: 3 cones are placed in a triangular form like in the diagram above. 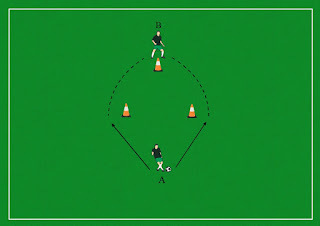 Player A is gonna pass the ball to the player B who runs by the cones in each side. Exemple: Player B runs in the right receives the ball, pass it back and withdraws by running back and runs again in the other side (left) and make the same thing all over again, until the coach end the drill.